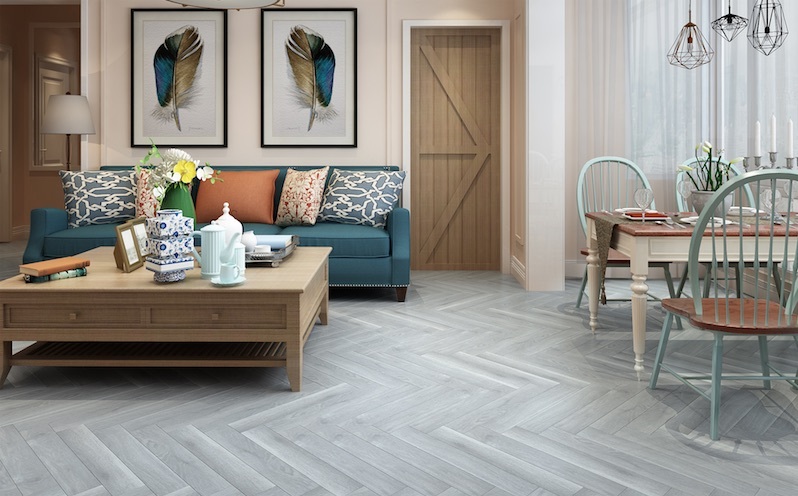 Authentic Herringbone Laminate flooring offers homeowners and commercial property managers a stylish, on-trend alternative to classic parquet flooring which is easier to maintain, more convenient and more cost-effective. Now property owners can have the design appeal of a Herringbone Floor, which can be laid in no less than 10 different variations, with the anti-allergic properties and the long-lasting durability of a Laminate Floor. Herringbone Laminate Flooring is easy to install without any glue or epoxy, using a patented interlocking system which allows the board to be simply clicked together. The wide variety of patterns available will have interior decorators spoilt for choice in creating the ideal look and feel for their interior spaces. In the construction of the laminate, each board is made up to resemble the natural texture of wood using a sophisticated photographic process. This decorative film is impregnated with melamine and finished with an anti-abrasive overlay making the top surface extremely resistant to scratching and staining. The core of the plank is made up of a high-density fibre board sourced from sustainable Conifer forests. For the ultimate resistance to moisture, due to the high density profile of the board sub-strait (HDF) there is a naturally high water/moisture resistance. The boards are finished underneath with a balancing film which prevents the boards from warping. Owing to the complete impermeability of the Herringbone Laminate, dust mites cannot breed and termites have nowhere to nest. Herringbone Laminate Flooring is an excellent choice for families with small children, or who suffer from allergies thanks to the hypo-allergic nature of the product. Finfloor offers a lifetime guarantee against termites, as well as a 25-year guarantee in a domestic setting and a 5-year guarantee when used in a commercial area. Finfloor is an innovative Laminate Flooring brand that prides itself in the trade of environmentally friendly products that are good for both people and the planet. Established in 1996, the company has continued to add award-winning and unique product ranges to their catalogue, including Inovar, FinOak, and Symphony EVP. All Finfloor products are made from raw materials derived from renewable sources, thus eliminating the need to source from natural forests and do not compromise on quality and style.